Picturesque villages cling precariously to steep sea cliffs with breathtaking rocky-shoreline vistas. The landscape is profuse with bright-hued flowers - and the coastal air is rich in fresh ocean-spray scents. 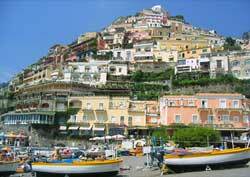 The Amalfi Coast drive is arguably the world's most beautiful and thrilling sightseeing road. It stretches 50 kilometers (30 miles) between Sorrento city and Amalfi village, the community that gave the coast its name. The Amalfi Coast roadway has only occasional railings to keep your car from potentially plunging into craggy, breaker-washed sea boulders far below. You can drive north or south on the drive. The fainthearted (but never the brave) prefer the northbound direction because the southbound lane precariously hugs the sea cliff edge. If the southbound Amalfi Coast lane is not scary enough, visualize a seemingly endless parade of northbound tourist buses sometimes brazenly encroaching your slender cliff-side lane.